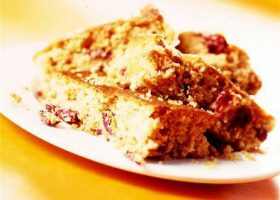 These deliciously moist health bars are a healthier alternative to the flapjacks and are packed with fruits and oats for a nutritious snack or lunch box addition. Preheat the oven to 180C/gas 4. Place the butter and sugar in a small saucepan and heat over a low heat until the butter and sugar have melted. Remove from the heat. In a large bowl combine the flour, oats coconut, cinnamon, sultanas, apricots and prunes. Then pour over the melted butter and sugar mixture and stir until well mixed and all the flour has been incorporated. Spoon the mixture into a lightly greased shallow 23cmx23cm square cake tin. Press the mixture down with the back of a spoon and smooth until level then bake in the preheated oven for 18 - 20 minutes or until golden brown and just firm to the touch. Remove from the oven and leave to cool in the tin for approximately 5 - 10 minutes before carefully turning out and leaving to cool completely on a cooling rack.